We at Spesso believe that the value of our products does not only resides in quality of the product but also in the service we are able to deliver to our customers. We work closely with them in order to better flow value through the supply chain. We create synergies in logistics through the VMI (Vendor-Managed Inventory) approach, a system that makes the management of the customer’s product stock easier and more effective both from the customer and the supplier side. Here is how VMI works. The basic requirements are that the supplier has the visibility of the customer’s inventory, so that he can check if criteria are met for production and shipment. If customer stock is below a certain agreed level, the supplier must produce and deliver one or more batches of product. One of the objectives of the VMI is keeping customer stock at the right level, avoiding excessive stock or stock shortage at the customer side. This system results in frequent flow of small deliveries to the customer that improve service, lower average inventory and the cost of the supplier’s procurement management. 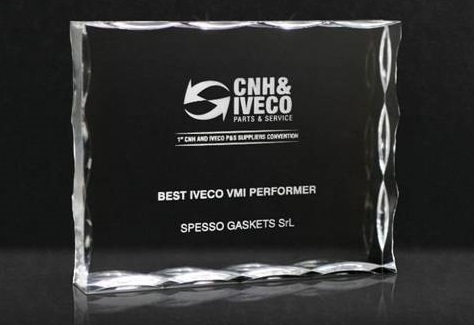 VMI is a win-win system, as it creates a much more regular flow of products, so both Iveco and Spesso Gaskets have agreed to expand it to over 80% of total sales. Other world class customers have also chosen to do the same. Now more than half of Spesso’s customers are managed on VMI, achieving a fill rate of above 98% for the past 5 years, as well as a sharp reduction of the customer’s average stock.